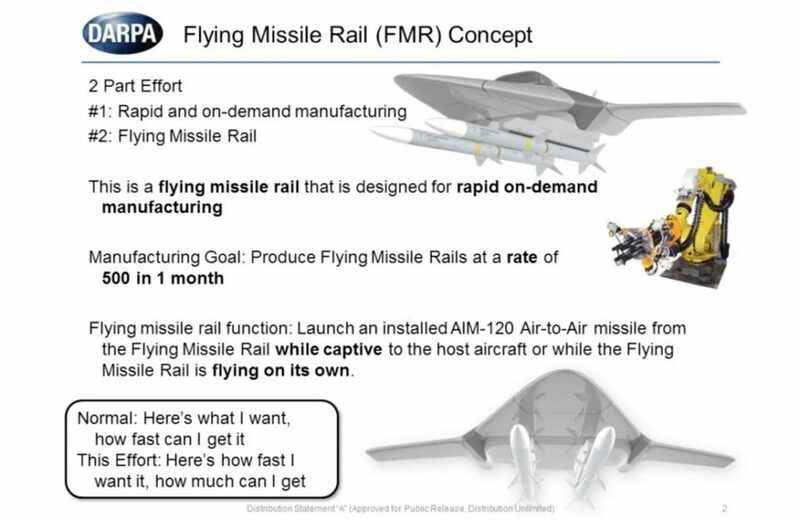 To that end, DARPA wants to do two things — develop a design for the Flying Missile Rail, while also working out a process for producing copies of the rail at a rate of 500 units per month. By comparison, the Air Force and Navy together requested just 325 AIM-120s for 2018 — meaning a production rate of around 27 missile per month. Ideally, the Flying Missile Rail — or FMR — will be capable of doing more than just launching an AIM-120. “An FMR is a device that can optionally remain on the wing of a host F-16 or F-18 aircraft and release an AIM-120 missile, or alternately, fly away from the host aircraft acting as a booster and extending the range of an AIM-120, Small Diameter Bomb or special payload pod,” Jones wrote. “Once the FMR reaches the target area, the FMR vehicle would be capable of loitering until the weapon is released.” DARPA hinted that industry bidders might also want to figure out how to fit two AIM-120s to a single flying rail. The drone rail must be compatible with the existing underwing hardpoints on Air Force F-16s and Navy F/A-18s. It must also have space for a radio and antenna so that the rail can communicate with the launching fighter. Jones stated in his notice that the FMR could share technology with the Air Force’s Loyal Wingman program, which is building plug-and-play line replaceable units — basically, boxes of radios, processors and other devices along with pre-loaded software — that can transform a manned fighter such as an F-16 into a semi-autonomous armed drone. Loyal Wingman itself dovetails with the Air Force’s QF-16 drone target program — which modifies old F-16s for pilotless, remote flight — as well as the Fifth-Generation Aerial Target effort, which is developing a cheap, stealthy target drone that could, in theory, possess combat capabilities. The Air Force is also working with drone-maker Kratos on the so-called “Low-Cost Attritable Aircraft,” of LCAA, which aims to produce a small, jet-powered armed drone that — like the Flying Missile Rail and could be manufactured quickly and cheaply. The flying branch wants to be able to buy batches of 100 LCAAs at a cost of no more than $300 million, roughly the cost of two F-35 fighters. Finally, the Pentagon has been tinkering with an “arsenal plane” concept that involves drones or manned fighters flying ahead of and designating targets for, heavy bombers carrying potentially scores of missiles. The drones and fighters act as nimble, flying sensors capable of surviving enemy defenses. The bombers stay out of harm’s way, waiting to fire barrages of missiles on command. Combining all these efforts — Loyal Wingman, 5GAT, LCAA, the arsenal plane and the Flying Missile Rail — and it’s clear where U.S. air power is headed. In coming years, vast swarms of drones — some newly-built, others pilotless versions of old manned jets — could fly into combat alongside manned fighters, each drone and manned fighter carrying its own, smaller drones armed with their own missiles. All the fighters and drones would be in touch with distant arsenal planes carrying additional missile-drones. The result could be a much more heavily-armed force capable of hitting targets at greater range, all while exposing fewer pilots to enemy fire. And here’s the kicker — this more lethal form of air power could actually be cheaper.